On Friday, February 21, Marian and I spent most of the afternoon wine tasting at Palmer Vineyards with our gracious host, winemaker Miguel Martin. We first met Miguel at Mega-Tasting 2013, where he represented Palmer. A warm friendly Spaniard who makes delicious wines, we knew then that we wanted to visit him at the winery. We arrived at noon, for once without a food plan. Not a problem, as it turned out. Miguel offered some excellent duck pâté and goat Camembert that we devoured while tasting his wines. The good news is that you can order the same thing when you visit Palmer for an impromptu picnic. 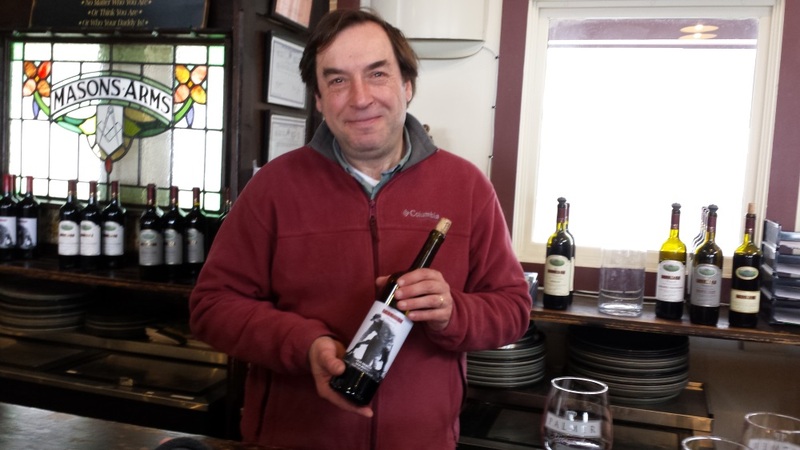 Miguel vinifies 20 different wines, some, like the Aromatico, in very small production. He told us about the complexities of managing the vineyards. Planning the orientation of the planted rows to the transit of the sun. Removing grape shade leaves on the north sides of the rows but leaving them intact on the south to protect the grapes as they grow. Dropping fruit clusters, especially for grapes with small fruit, avoiding mold as well as intensifying flavor. With an experienced vineyard management team, these tasks and many more are handled with skill and finesse. Oh yes, and they practice sustainable agriculture at Palmer. 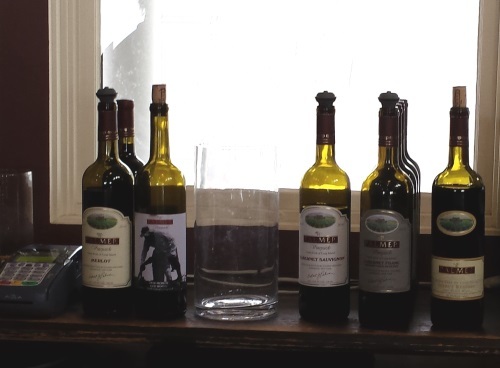 Strict control of pesticides, using horse manure instead of chemical fertilizers, and other approaches have earned Palmer a “certified” designation from Long Island Sustainable Wine-growing. Miguel’s wine-making approach is straightforward… with good clean fruit and good and careful work in the vineyard, you will get a great result. That is of course, if you grew up in wine-loving Spain, majored in agrarian engineering and viticulture at the university, then studied wine-making at U.C. Davis, and spent years learning your craft. As you might expect, we sipped our way through whites first, guided by Miguel. 2013 Sauvignon Blanc. Are you used to the grassy New Zealand interpretation of this varietal? This wine is something completely different. A very mild green note combined with pink grapefruit. Very dry, and perfect to accompany oysters. We were surprised and pleased at how much we liked this wine. Two corks up. Palmer has two chardonnay offerings. One sees only steel, while the other, the Reserve, enjoys a sojourn in oak barrels. We tried both and liked both. The 2012 North Fork Chardonnay is the steel-only wine with brilliant acidity. Light straw in color with 13% alcohol, we thought this would make an excellent accompaniment to white fish and white meat. At $16.99, it would also be an excellent picnic wine, sure to please you, or us. We took a bottle home. Yes, 2 corks up for this one. The 2009 Reserve Chardonnay also had great acid, and a honey nose. 13.5% alc. On the palate it was grilled pineapple all the way. Grilled pineapple is a desert we enjoy as I grill in the warmer weather. The grapes in this wine are all estate grown, and the result of good clean fruit and Miguel’s magic is a delicious, juicy bottle of wine. Can we give this one 3 corks? Enjoy it at $18.99/bottle. We took a bottle home and polished it off later in the week, with my Pork Marsala. It was a super pairing, if I may say so myself. The 2012 Pinot Blanc brought back memories of our travels in Alsace, France. Pinot Blanc is a go-to wine that pairs wonderfully with chicken and pork, and that is what came to mind. Pinot Blanc is one of those tiny grapes clustered in large bunches. This is what Miguel had in mind when he mentioned aggressive dropping of fruit to ensure a great final result. This wine spends its time in steel, and is fermented with our local natural yeast. With Miguel’s guidance, the yeast makes a wine that is unique. With a great mouth feel that is just slightly oleaginous and brilliant acid, this one is a winner. At $22.00/bottle, we took a bottle home. This is another 3-corker. Aromatico is the small production wine I mentioned earlier in the post. I mean small. Miguel vinifies 35 cases, and that is it. To make sure there is enough to go around, this wine is bottled in 500 ml bottles. OK, but what is Aromatico? It is a blend of 60% Muscat and 40% Malavasia. Dry muscat is an Alsatian Grand Cru grape that is fabulous with pork, and Malavasia is an ancient and flavorful varietal enjoyed in Roman times. Miguel has planted these grapes near the LI Sound, so there is a briny element to the wine. This is truly a unique pour for a meal of scallops, or a cheese course, or dessert. Want some? Act fast because 35 cases is a tiny production. At $25.00/bottle, you can enjoy a hand-made wine that you won’t find anywhere else. Yes, the usual corks are up. 2013 Albariño in the tank room This is a white wine varietal, typically from Galicia in the northeast corner of Spain. It is a favorite of ours, as it pairs perfectly with seafood. We were pleased but not surprised that Miguel would produce this delicious wine. He avoided overly floral rose-in-the-face characteristic of many we have tasted. The wine we tried will be ready for bottling and release this month (March). You can see Marian and Miguel, standing in front of the tank. This wine is a 2-corker, for sure. What is there to say? We knew Miguel made a great Chard, and love the broad of whites he produces. When you visit Palmer, be adventurous and try something that is new-to-you! You will be glad you did. 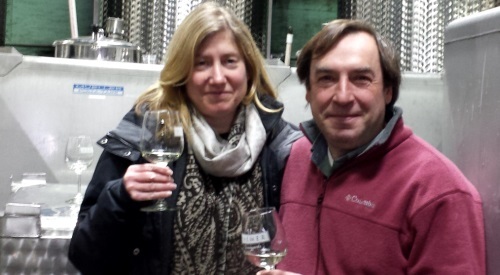 When Marian and I have visited Palmer for a glass of wine and a picnic lunch, we usually picked one of the Chardonnays, so we were eager to taste Miguel’s reds. Here is what we enjoyed, in the order we tasted. 2010 Estate Merlot this is a beautiful example of what North Fork Merlot can be. Delicious red fruit and good acid makes this a winner. We both said “steak” and polished off a bottle that evening with grilled rib eye. The brilliant acid cut the rich rib eye and made an excellent pairing. At $25.00/bottle, we loved it. 2010 “Old Roots” Merlot – Miguel made a special selection from the best barrels of the 2010 Merlot produced by the oldest vines at Palmer. This “Old Roots” bottling is the result, and yielded only 90 cases. Yes it is special. A raspberry nose leads you to a violet top note on the palate, and a rich red fruit bottom. This one is right for pan seared filet mignon. At $42.00/bottle, it properly reflects the effort Miguel and his team went through to organize, select, and bottle their finest production. A bottle of this came home with us, and awaits its tenderloin dinner mate. 2009 Cabernet Franc – Yikes, this tightly focused wine is nearly sold out, and I can see why. The fruit is hand-picked, and completely ripened. No bell pepper in here. The wine spends 2 1/2 years in French and Hungarian oak barrels, and is malolactically fermented.With beautiful deep red color, great acid, and deep red fruit flavor, Palmer’s Cabernet Franc is a winner. Yes we took one of these home, too. I think it would be great with a grilled steak, or some grilled lamb sausages. It is,$29.00/bottle, while it lasts. 2010 Cabernet Sauvignon – Yes, still going strong thanks to the duck pâté and goat Camembert, we tasted this delicious Cab. Miguel told us that Cabernet Sauvignon is the most difficult grape to grow on the North Fork. This Cab spends 2 1/2 years in French oak, giving the wine some very elastic tannin. It drinks well today, and has 5 years of bottle life ahead of it. When I taste a Cab, I wait for the chocolate on my palate, and this one delivers. Give credit to Miguel and the Palmer Vineyard staff for producing something this good. At $28.99/bottle, this labor of love is worth it. We thought so, and took a bottle home. 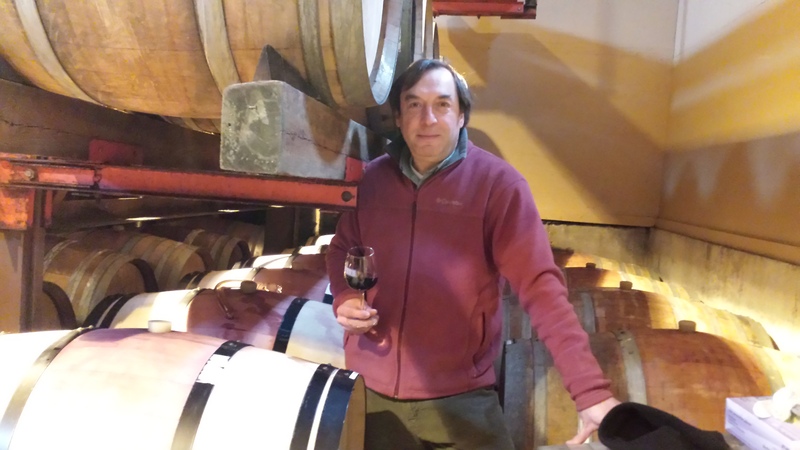 2013 Syrah in the cask room – Miguel took us into the cask room, wine thief in hand. Soon we were sampling his Syrah, still undergoing its aging. A very flavorful wine, Miguel will release it in the Fall of 2013, and you can be sure we will be ready to taste the bottled wine. Well, we were really pleased to taste these delicious reds. At the Mega-Tasting 2013, we only got as far as Miguel’s whites, and we discovered just how great his reds are. When you visit Palmer, don’t limit yourself to your usual choice. Take the time to discover what Miguel and the Palmer team have produced. It is all here, waiting for you. Did you know Palmer has a wine club? When Miguel told us, we joined, and took home our first half case of wine. There are two membership levels, a one case commitment, and a two case variant. We went for two cases. You can select which wines you want and have them shipped, or pick them up at the winery. We decided on the pick-up as we are often in the neighborhood. There are more benefits to club membership, such as special group meals and free tastings, so why not join, and be a part of something great. Hey, you will get a chance to meet Miguel and the Palmer team, and see where that great wine comes from. Our afternoon with Miguel came to an end, and we drove home to enjoy his wine with our steaks. Not a bad day, I’d say. Your Palmer adventure has not yet begun, so go and see why we think Miguel and his wines are terrific. Next time, we’ll tell you about the Gabriele Tranchina Ensemble and a WineFest 2014 afternoon at Raphael. Until then, enjoy your trip around town!